When a distress call from a crippled space freighter arrives, there is only one man/woman/thing for the job – Constable Cactus. And that is exactly where this super smooth, very slick twin stick shooter kicks off. Constable Cactus is your everyday junior android cop, albeit one who needs to head off out into the universe in order to help a ship that has gone under attack from its own robot workers. With a well fed story behind it, and a vivid Japanese styled bullet hell gameplay mechanic holding things together, you won’t have time to breathe, or think, throughout the entirety of your time with Assault Android Cactus. Taking control of Cactus – or one of an army of unlockable friends – it’ll be up to you to utilise your very best twin stick shooting skills as you navigate your way through tight stages which are filled to the very rafters with a variety of cunning enemies. You’ll find that bullets will most definitely fly as you attempt to help save the stricken ship from being overrun by an evil force. 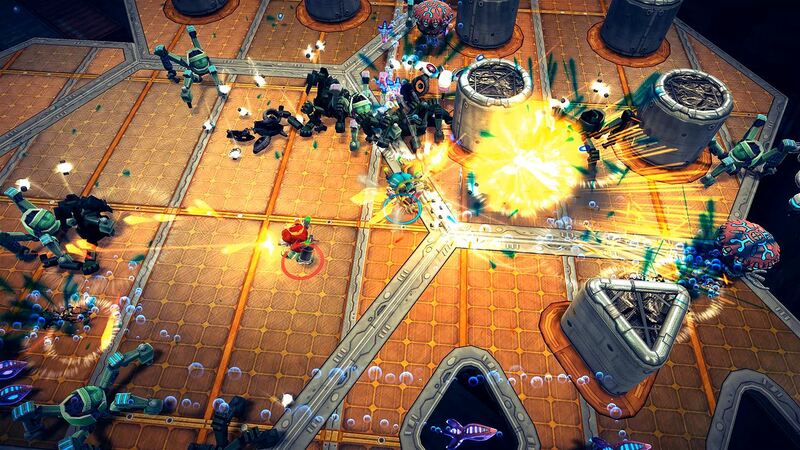 And it is those bullets which ensure that Assault Android Cactus is a little different from many of the twin stick shooters that lay claim to the best in the genre. You see, whilst Cactus comes with her own little machine gun and flamethrower combo, her new found friends – Holly, Lemon, Coral, Starch, Aubergine, Shiitake and Peanut – all have access to different weapon sets; seeker missiles, shotguns, lasers, mines, drills and more all feature. This ensures that should you start to struggle with one stage, failing to take down the forces in front of you, a retry with a completely different character and weaponry may just be enough to push you through to the finish. Every kill you make sees multiple collectible shards dropped and the collection of these is vital for progression purposes. You see, each of the millions that will drop throughout your time with Cactus and her friends will see your weaponry increased to higher levels, dishing out more damage than ever before. With the choice of long range, mid range or up close and personal arsenal options at your disposal, it’s great fun to play through things as multiple characters, finding your own preferred playstyle and tactical opportunities. Whilst those shards are super important, further pickups see you given the choice of a limited time speed boost, further weapon upgrades or the malfunction of all the enemies on the screen – something that is vital in times of need. These are great and it brings a extra tactical edge to matters, as you watch the pickup scroll slowly through its options before you decide on the course of action to take. But there is one last pick up that needs talking about and that is of the battery. You see, the whole premise of Assault Android Cactus revolves around the android way of life, and battery power is all important to that. That’s because Cactus and her friends can’t actually die, and any depletion of the usual health bar only sees precious time wasted as a mash of the shoot button attempts to fire each character back into life again. A lack of death may initially seem silly, and it may point to the game being simple to complete, but holding everything together is a battery power meter that is constantly draining. Once it reaches zero, the level will end and the space freighter you are trying to save will be doomed. It is therefore vitally important that you pick up any battery that gets dropped, in order to recharge the level’s timer and give you a better chance of ridding each stage of the hundreds of enemies that are in situ. It’s a system that works brilliantly well, and sees the single player occasionally having to struggle between the decision of running across the screen in the hope that they can grab the battery, or whether they should take down just a couple more enemies first. 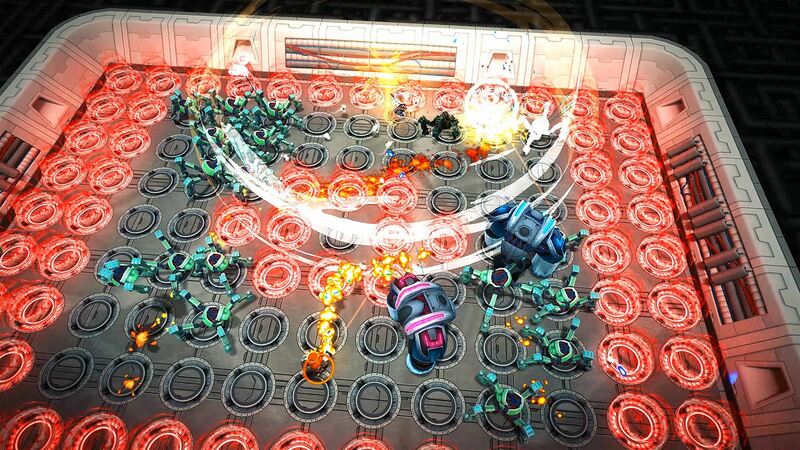 Death in Assault Android Cactus isn’t the be-all and end-all of everything, but getting knocked down and having to respawn seriously dents your chances of proper progression. Absolutely beautiful visuals have been put in place by the team at Witch Beam, and without a word of a lie, it’s a delight to run through this experience with enhanced Xbox One X graphics taking hold. An equally stunning soundtrack and sound effects system compliments those visuals brilliantly, and they combine to ensure that you’ll want to play the game over and over again. It’s not particularly lengthy mind you, and your experience will probably be over in roughly four hours or so – more if you can manage to coerce a friend or three in too. That’s because whilst Assault Android Cactus is great as a single player title, it can however also be played in multiplayer form, whether you go to it with friends or via the unlockable AI co-op mode. This obviously makes any battery collection processes easier, and that in itself lengthens the time you will spend playing the game. It doesn’t make things any easier though, as in return for more than one player being on-board, the enemy count is ramped up massively. 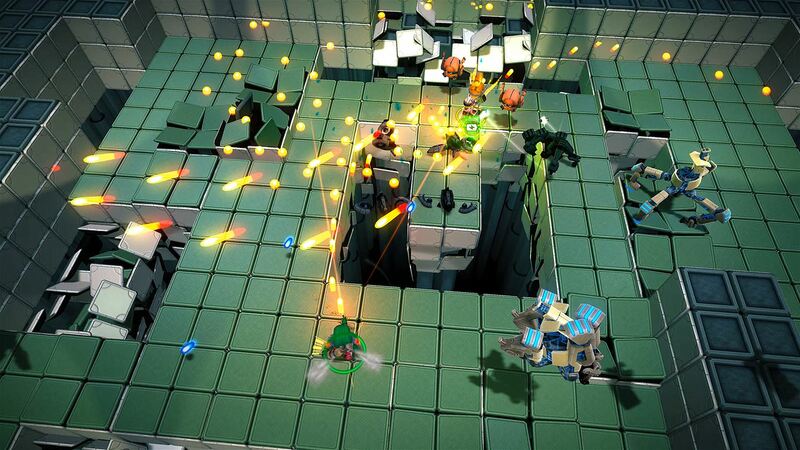 It is in this multiplayer system where Assault Android Cactus comes into its own, and it’s a hugely rewarding, massively fun game for multiple players to get involved in. Or even for the solo player with the clever AI beside them. Away from the main campaign, and there are a few other options available, but they all seem to run along the same lines. Leaderboard chasing aside, and Infinity Drive does what it says on the tin and tasks you with fighting your way through infinite waves of enemies and bosses to see how well you do, whilst the Daily Drive delivers a different challenge over a 24 hour period. There is also the opportunity to really mix things up with multiple game changers. It is these game changers which are brilliant in fact, and should you be found succeeding in any of the other modes, collecting coins for each successful level completion, you’ll be able to unlock a variety of game options. The earlier mentioned AI co-op mode is one of these, and that extends the fun of Assault Android Cactus massively, whilst further visual changes are nice little touches. There’s even the chance to remove yourself from the third person, slightly top down view point that Cactus runs with by default, to take in the action from a first person view, or one without a HUD, or via an isometric camera. For a bit more fun, these are great and ensure that you can play Assault Android Cactus the way you want. Personally, I much prefer the standard options, but should you wish to mix things up then it’s great to see the opportunity is there. There are also even more things to purchase via these in-game credits and should you feel the need to mop up all the achievements, you’ll have to have purchased everything available in the Art Gallery and the hugely deep Codex which details everything and anything you could ever want to know about Cactus, her friends and her enemies. If you need even more depth, then the developer commentary option is a lovely addition. 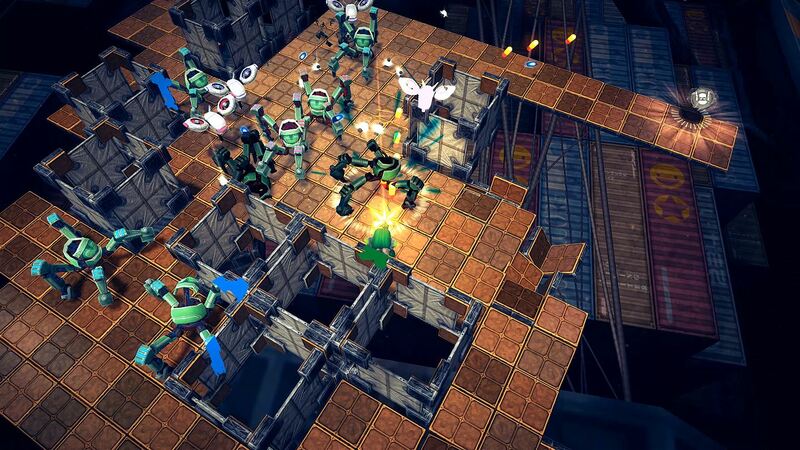 So for the most part I’ve hugely enjoyed what Witch Beam have created with Assault Android Cactus. But what don’t I like? Well, by default, it’s all a bit simple – at least until the very final boss stage – and could really be completed in an evening’s worth of play. I’d therefore liked to have seen a few extra levels created, because even though the option is there to amend your settings, drag in new players and participate in the other game modes, it is the campaign that is the real fun. I’d also adore the chance to have an auto-fire mechanic brought in as throughout my time with Cactus, I’ve yet to let go of holding the firing trigger on full. But otherwise I cannot find fault in either the visual or audio styles, or in the super smooth gameplay mechanics that brings Assault Android Cactus together. 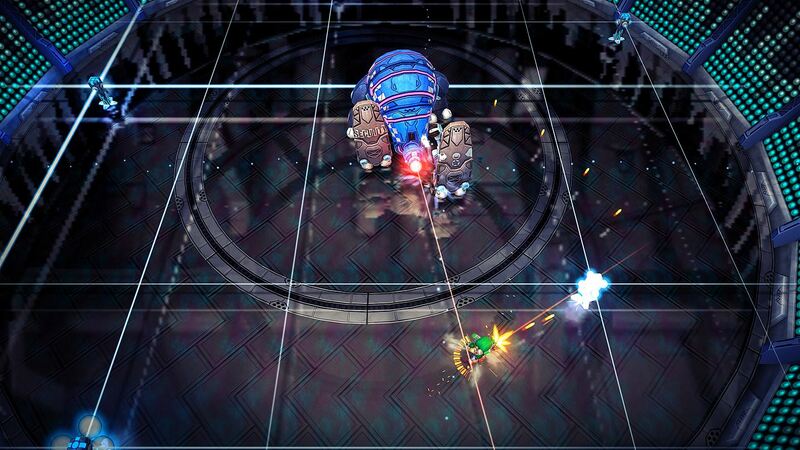 If you’re in the market for a new twin stick shooter, one that brings a fun little story, some top notch bullet-fuelled gameplay and the chance to go and chase those highscores of your mates, then Assault Android Cactus more than delivers.